The Delaware River Turnpike Bridge is closed indefinitely as workers continue efforts to stabilize the structure after a large crack was found in steel truss beam. The Pennsylvania Turnpike Commission released photos of the fracture over the weekend. 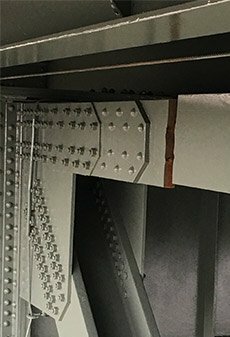 Meanwhile, a comprehensive engineering assessment and structural analysis is underway to determine a permanent repair strategy, and no timetable has been set for the reopening, according to the commission, which co-owns the bridge over the Delaware with the New Jersey Turnpike Authority. The toll bridge connects the Pennsylvania Turnpike (I-276) and New Jersey Turnpike. Officials announced Saturday that the bridge will remain closed for at least two weeks for the assessment before a timeline can be set for the repair. They said it was impossible, this soon, to estimate how many days or weeks the bridge will be closed. The 1.2-mile bridge, which opened in May 1966, was deemed unsafe and immediately closed Friday following the discovery by a NJTA resident engineer of a fracture on a 14-inch truss beam on the Pennsylvania side of the bridge just below the deck in the westbound right lane. During the closure, the bridge will remain under round-the-clock watch utilizing a high-definition video survey. The bridge carries a total of more than 42,000 vehicles per day. The Delaware River Bridge was due for rehabilitation as part of a longer-range project, not yet in preliminary design stage, to construct a parallel turnpike bridge to the south of the existing bridge. The new bridge would be built first to accommodate both east and westbound traffic while the existing structure is rehabilitated. Once that work is completed, westbound traffic would run on the existing bridge, while eastbound traffic cross on the new bridge. Construction is proposed for no earlier than 2025. Meanwhile, a $1.4 billion project to connect I-95 and the Pennsylvania Turnpike continues. A cashless toll at the bridge in debuted in January 2016 as part of the project. Sometime in late 2018 it is expected that a ramp for westbound Pennsylvania Turnpike traffic will connect to southbound I-95 and second ramp on northbound I-95 will connect to the eastbound turnpike. The work is part of a larger effort to make I-95 continuous from Maine to Florida. Motorists traveling east from Route 130 will be able to use Interchange 6 to access the New Jersey Turnpike via the Pearl Harbor Memorial Extension. The westbound Pearl Harbor Memorial Extension will remain closed to all traffic; there will be no access to Interchange 6 from that direction. Local roadways under the bridge including Radcliff Street, Palmer Avenue and Wood Avenue are also closed until further notice.